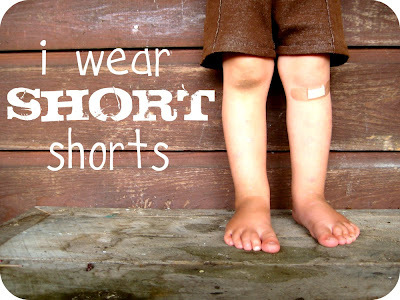 Recycled Fashion: Fashion revolution, boys knees! Dee of Dee*Construction, wishes to start a fashion revolution, and I like it! 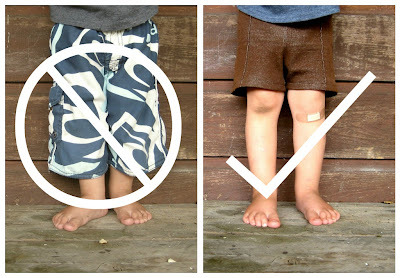 Little boys shorts should look like this..
Not this (on the left)..
Show off your grubby knees little boys! $2 from a children's market, in his solo game of musical statues! thanks for joining the "revolution"! 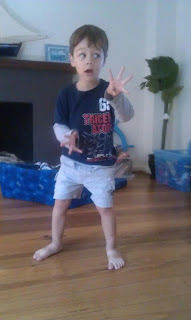 I too will join the revoloution - and Op Shop Jnr has some pretty grubby knees some days! So cute! i like the length.I think it's perfect, those little knee caps are too cute to be hidden. Very cute! That is the perfect length for boys shorts.